My husband has this recliner. I call it his “Archie Bunker” recliner. He loves it and when I married him, I married that damn recliner. Fast forward 10 years and it still holds a place of beauty(?) in our living room. Surrounded by a Maxalto sofa, Antoine Proulx coffee table, and beautiful art. In relationships you pick your battles….and that is why I’m building a new case. Lusso was very fortunate to partner this week with a new manufacturer. 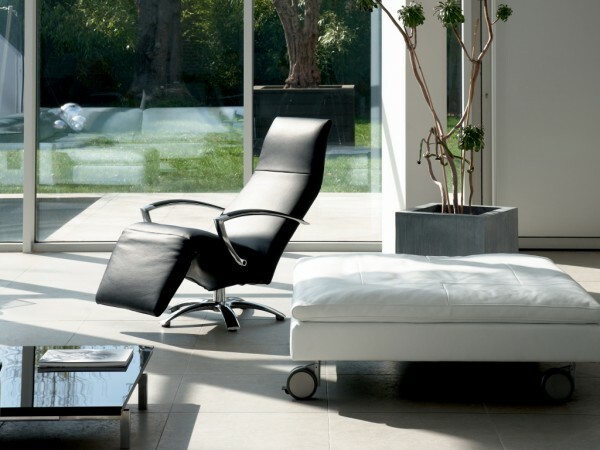 JORI was founded by Juan Jorion in 1963, when he began creating and producing contemporary seating. Over the years JORI has become known for their luxury leather seating that can be customized to the clients needs. They always aim for “mental comfort” when designing their pieces. What this means is that the comfort, quality, and design are so in sync that the body can relax completely. There are many many manufacturers out there producing recliners for a high end market, but JORI takes it a step further. Almost all of their models come in a variety of seating heights, depths, and back heights. They also create many built-in features that allow the client to adjust the chair to their personal needs. Men love their recliners. I’m pretty sure this goes back to caveman days when they reclined on rocks. But let’s be honest, we ALL love recliners. Putting your feet up after a long day is heaven. Now you can have a comfortable chair, that is also a work of art.